For the third year in a row, Dr. Paul Vitenas named by Castle Connolly as the Regional Top Doctor. Dr. Paul Vitenas named by Castle Connolly as the Regional Top Doctor. Houston, TX – Paul Vitenas, M.D., F.A.C.S. is excited to announce that he has been named as a Top Doctor for 2016 by Castle Connelly. The annual list of outstanding doctors identifies the top physicians, in all specialties, across the United States. Dr. Vitenas has been at the top of Castle Connelly’s coveted rankings for three years in a row. The Castle Connolly list of Top Doctors was established in 1991 as a way to help patients find the best available healthcare with ease. Only those doctors with a demonstrated commitment to delivering exceptional patient care can take home the Castle Connelly title of Top Doctor. Nominated by their peers, the Castle Connelly awards are open to all Board Certified MDs and DOs in the country. Every year, tens of thousands of doctors cast their nominations online. The winners are selected without bias, using physician-led research teams to screen qualifications, training, hospital appointments, disciplinary histories, and performance ratings. Approximately 5% of the nation’s licensed physicians are selected as a Castle Connolly Top Doctor in their region. 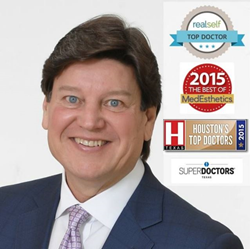 The winner of many awards throughout his distinguished career, in just the last year, Dr. Vitenas has taken home the 2015 Healthcare Design Award from the American Institute of Architects, the Top Board Certified Doctor by Modern Luxury Magazine, the City Beat News’ Spectrum Award for Excellence and earned a place as one of the RealSelf 100 Top Cosmetic Surgeons. His Houston practice has also been named as a Top Clinic of 2016 by the Top Choice Awards. Dr. Vitenas is Board Certified by the American Board of Plastic Surgery and an alumnus of Tulane University Medical School. Over the last three decades, he has grown his practice into the most prominent aesthetic office in Houston. In 2014, Vitenas Cosmetic Surgery moved into their newly constructed, 19,000 square foot building, which now houses Dr. Vitenas’ own Mirror Mirror Beauty Boutique and the Houston Surgery Center. For more information on Dr. Paul Vitenas, contact Vitenas Cosmetic Surgery at 281.484.0088. Conveniently situated in the heart of Houston, Dr. Vitenas offers patients complimentary consultations both in-person and online. The full list of Castle Connelly’s 2016 Top Doctors can be found at http://www.castleconnolly.com.